It's possible to add custom "one-off" notes to dates on rotas. This can be really useful for recording important information that needs to be communicated to those serving on that rota on that date. 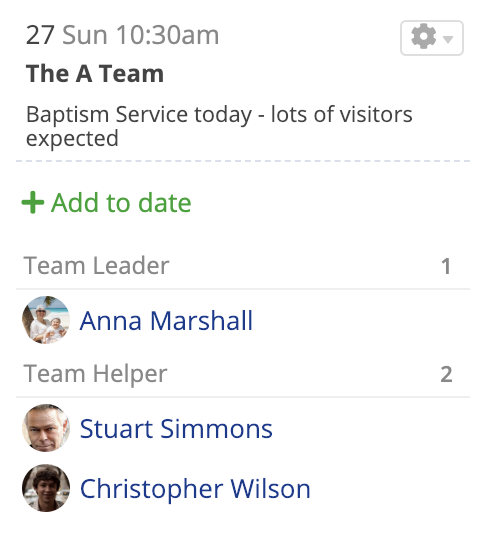 For example, when you need to let your Refreshments rota members know they'll need extra supplies for a busy baptism service. You might also use a note to record the name of a guest/visiting speaker on your Preaching rota (where the guest/visiting speaker is not in your Address Book). You can also paste the URL of a linked file into a rota note and that file link will be clickable - perhaps opening a file stored in a third-party file storage solution like Google Docs, Drop Box, or iCloud. 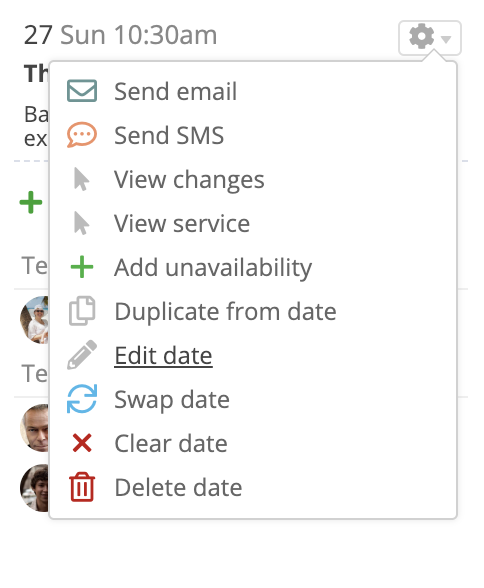 On any date for a rota, select the action cog drop-down menu in the top-right corner of the date and select Edit date. On the Edit date pop-up, add or edit your important information in the Notes field. Click Save Changes. Importantly, rota notes added in ChurchSuite display on the rota in the My Rotas section in My ChurchSuite. Rota notes also show on all rota reports, including the Overview report and in Rota Reminders. 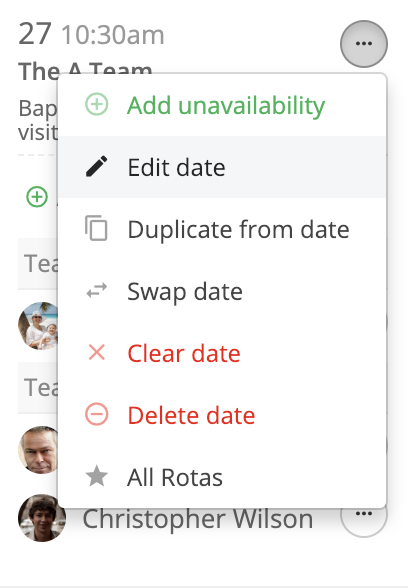 Within the My Rotas section, on any date in any rota, select the Edit date option from the drop-down menu in the top-right corner of that date. 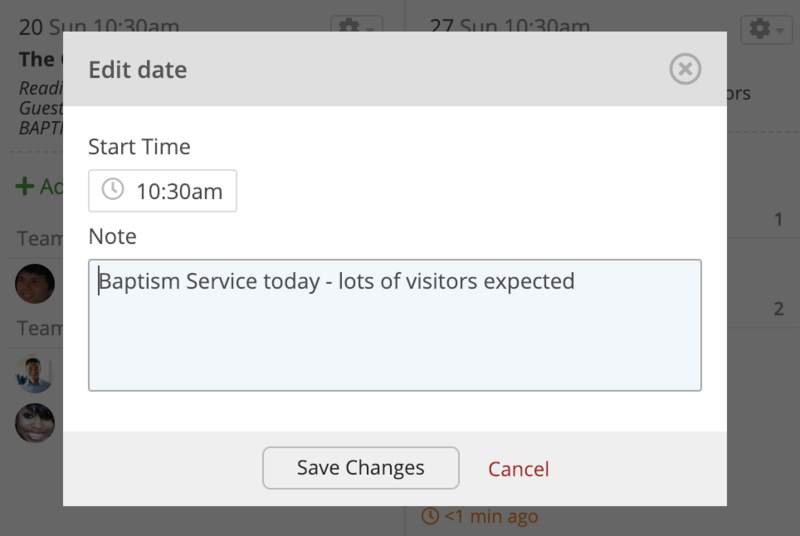 Importantly, rota notes added in My ChurchSuite display on the rota within ChurchSuite. Rota notes also show on all rota reports, including the Overview report and in Rota Reminders, and the All Rotas report in My Rotas (if enabled). The rota notes feature works on a rota-by-rota basis - rota notes do not automatically push to every rota that shares that rota date. If you wish to add notes that show on all rotas, you should use service notes - service notes show in italics on all rotas for a service. Rota notes allow you to add ministry/rota-specific. 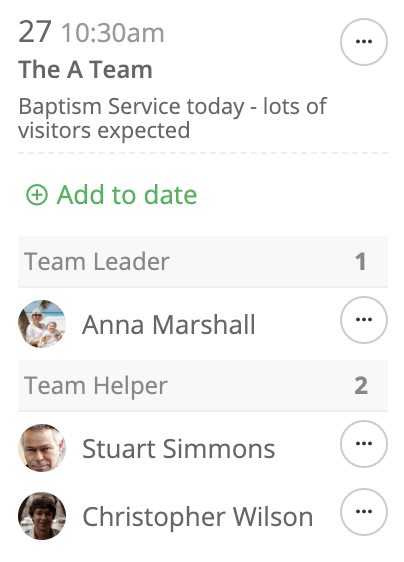 In the example above, the welcome team need to know it's a baptism service with lots of visitors expected; but a similar note for the set-up team might be to set out extra chairs.